Locally sourced materials and the use of green roofs helped with the sustainability components of the project’s design, reducing construction and cooling costs. A three-dimensional translucent ceiling design allows a heavy flow of natural light to penetrate the interior, reducing heating costs in the winter and electricity costs year round. The project’s green roofs, sky bars and large Mediamesh display attract passersby and create significant and ongoing buzz around the plaza. A 66 by 82-foot dome-shaped sculpture rises, like the formation of a tornado, from the ground floor, with spirals of entangled bronze and metal mesh. Within the 36-bronzed ribs, there are nearly 23,000 square feet of golden Mandarin GKD mesh, becoming the world’s largest woven metal sculpture. 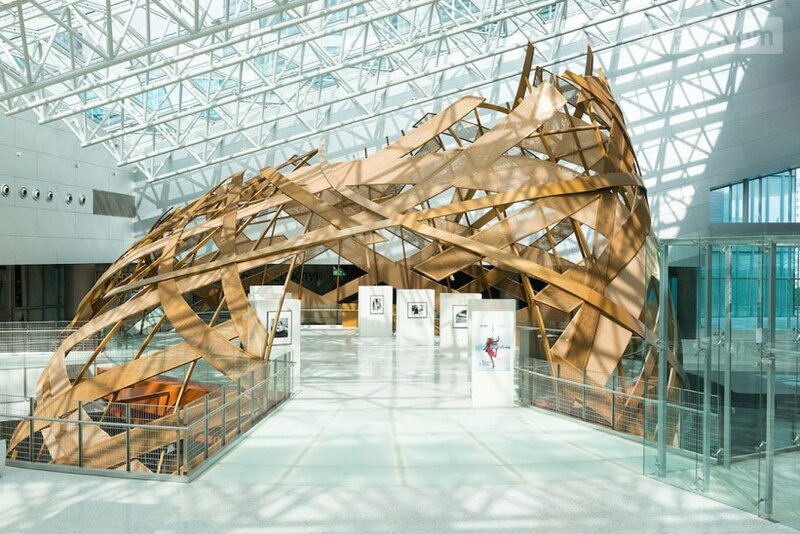 According to our European counterparts, the curved form of the ribs required 140 free-form cuts of the bronze metal fabric, whose contours were projected onto the mesh panels in 1:1 scale using a laser. Thanks to its flexibility, the texture flows and organically traces the lines of the three dimensional rib forms. Curved frames with clamping profiles were used to attach the materials.